DIMENSIONS: 85cm x 38cm x 35cm. Seven Separate Sections - for organised kit storage. Large Side Pockets for extra storage. Internal Padded Bat Pocket - to protect your most important item. Padded Shoulder Straps for added comfort whilst carrying. Lined Valuables Section - to keep your personal possessions safe. 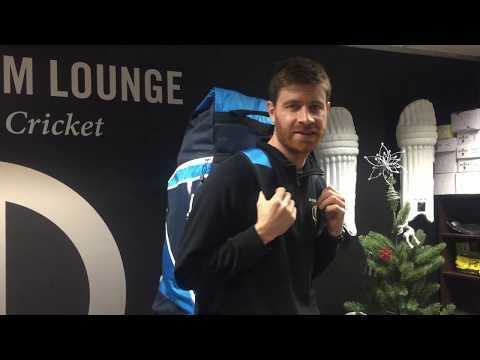 The new range of Gray-Nicolls luggage – the GN800 – features a fantastic duffle bag option that will become an essential product for cricketers across the globe. In striking blue, navy and grey, the GN800 Duffle Bag is a high performance, high-class item with a host of brilliant features. Featuring seven storage pockets, there is ample space for all your kit needs – even for cricketers with more kit than they could ever use. There is a primary storage item in the heart of the bag, with ample room for pads, shoes and helmet to fit comfortably. The internal padded bat pocket ensures your trusted weapon of choice is protected at all costs, while there are multiple areas to keep those little extras that cricketers like to have on them at all time – such as tape, scissors, grips and bat cones. Precision engineering is the order of the day with the Gray-Nicolls GN800 Duffle Bag. There are two shoulder straps on the bag, featuring fabulously soft padding that ensures whoever is wearing it will never experience any discomfort. Gray-Nicolls have also included a lined valuables section, helping keep your personal items safe. Perfect your young cricketers and club players; the GN800 Duffle is functional, comfortable, and brilliant value for money. It comes with the Gray-Nicolls promise of quality and performance.